Some months ago, Hulu.com shut out Boxee (or, at least, attempted to) from playing its content within the Boxee media center application—an application that allows you to enjoy web-based streaming media content without the hassle of accessing it through a Web browser. And, at the time, many wondered what was in it for Hulu. Its commercials played within Boxee so Hulu continued to have the requisite eyeballs running over (or looking away) from one of its income streams. 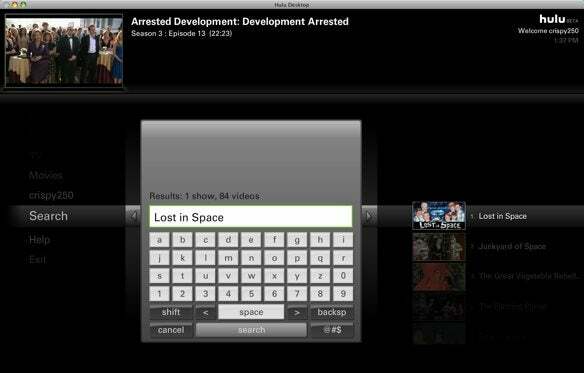 Yesterday, a piece of the puzzle was revealed in the form of the beta Hulu Desktop. Unlike with Boxee, Hulu has complete control over Hulu Desktop’s actions—actions such as commercial interactivity and advertising embedded in the interface that provides additional revenue for the company. I’ve had some hands-on time with Hulu Desktop and these are my thoughts. Hulu has already updated Hulu Desktop, and for good reason. The initial build was flaky. Although I was able to get it to launch once, subsequent attempts found an application that stalled out while attempting to load content. Thankfully an update, issued just hours later, appears to have fixed these problems. Hulu suggests that you have a Mac with an Intel Pentium Core Duo 2.0GHz or better with 2GB of RAM, running Tiger or Leopard over a 2Mbps or faster Internet connection. This is reasonable, though not an absolute requirement. I managed to get Hulu Desktop running on a Dual 2GHz Power Mac G5 with 1.5GB of RAM and it launched and played, though the video wasn’t smooth. It did play smoothly, however, on my 2.0GHz Intel Core 2 Duo Mac mini with 4GB of RAM, that I use as a media center. The experience playing web video through Hulu Desktop isn’t terribly different from using media center applications such as Boxee, Plex, or XBMC in that you have an interface designed to be controlled with a couple of keyboard keys, a mouse, or a remote control such as Apple’s hardware remote. As with these other media applications you navigate Hulu Desktop by traipsing down a series of hierarchical menu command—commands that include Now Playing, Popular, Recently Added, TV, Movies, Profiles (or your user name if you’ve logged onto Hulu with your identity), Search, Help, and Exit. 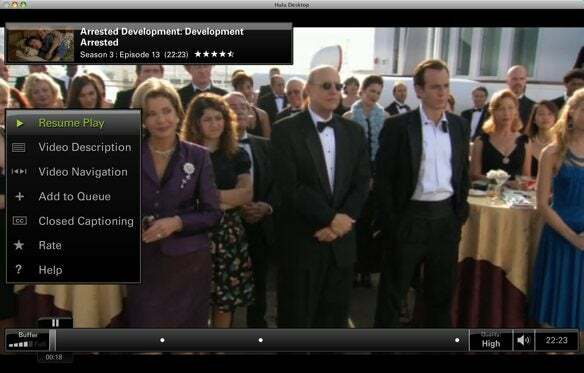 The content available through Hulu Desktop approximates what you get from Hulu when accessing it through a Web browser. Programs and movies include short-ish commercials (15 – 30 seconds) at the beginning and then sprinkled throughout the show or movie. As with Hulu in a Web browser you can watch a video in full screen or within a window and skip ahead or back through the video (you can’t skip over commercials, however). That video is encoded in the Flash format and can’t be downloaded. Unlike with the web version of Hulu, you don’t have the ability to dash to another site to watch a program via a link embedded on Hulu. For example, go to Hulu.com with your Web browser, search for Lost, and you’ll find a list of episodes for that fine ABC program. Click on an episode and you’re taken to ABC.com, where you can watch the show. Hulu Desktop limits you to just that content that you can view within Hulu.com. When you select a program to watch—Alfred Hitchcock Presents, for example—you have the option to browse available episodes, browse by season, subscribe to that program (similar to adding it as a favorite so you can quickly navigate to that program in the future), and view recommended programs you might like, based on the program you’re currently looking at. Using that Alfred Hitchcock Presents example, for instance, recommendations include the Hitchcock classic, Vertigo, and the TV series Night Gallery. Vertigo serves as a good example of incomplete content. Should you select Vertigo you’ll discover that you can’t watch the entire movie, only clips. This is a nice feature if you want to quickly dial up a favorite movie moment, but it’s also one that’s likely to raise and then dash the hopes of those desiring to watch a favorite TV show or movie in its entirety. Navigating with a paused video. The video looks darned good, even when displayed on a large monitor or TV screen (as would be the case for a Mac you’ve designed to be a media center and jacked into a TV or AV receiver). Much as I like Boxee and the service it provides to my Apple TV and Mac, Hulu Desktop is a pretty slick media player. Those who’ve depended on Boxee in the past for Hulu on the bigger screen have an attractive alternative—and one that Hulu isn’t determined to break. 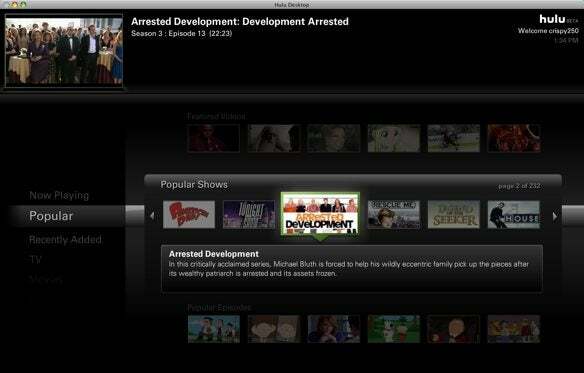 In the Boxee Blog, Boxee’s Avner Ronen has said that he and the Boxee team are in contact with Hulu. Now that Hulu doesn’t appear to object to its content being displayed outside a Web browser, Ronen and team hope Hulu will allow them to officially support the service. I wish him luck as I like having multiple content sources available within a single application—both those on the Web as well as local sources such as my network of computers—but given those Amazon links and the potential to monetize Hulu with other commercial components, I wouldn’t hold my breath.